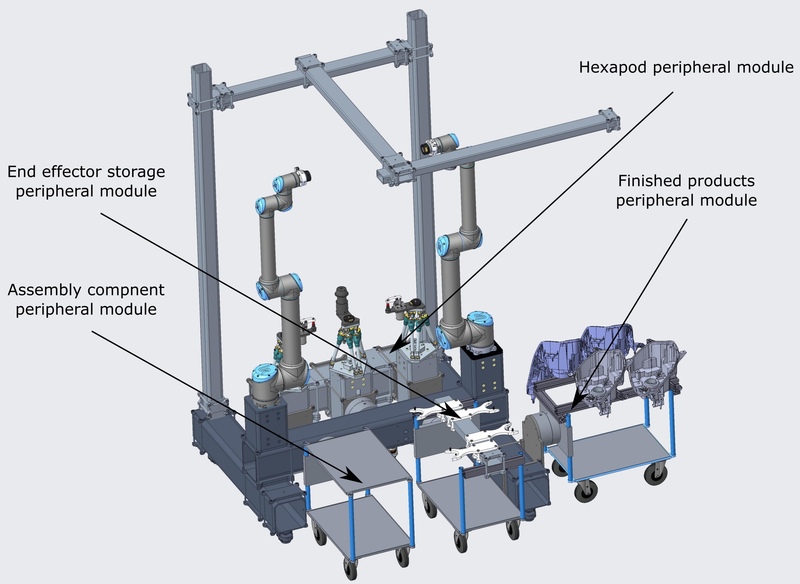 The reconfigurable jig (referred to as Hexapod) is a crucial part of the reconfigurability aspect of the ReconCell workcell. Reconfiguration within a product family is achieved by grasping the tool changer part mounted to the top plate of the hexapod, releasing the breaks, and repositioning the top plate. Automatic hexapod reconfiguration for the assembly of two different models of automotive light housings. As part of the ReconCell project, an innovative passive linear unit was developed. It uses no additional actuators or measuring equipment to re-position the robot base. The movement is performed using the robots own actuators and measuring systems. The robot re-positions the base by connecting the tip to the workcell frame, releasing the brakes, and then moving its own base along the linear guides. Robot base reconfiguration using the passive linear unit by connecting the tip of the robot to the frame. 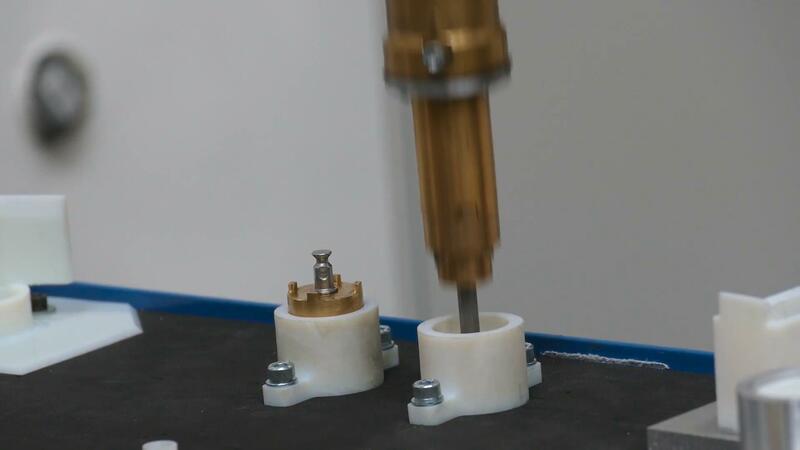 We developed a reconfigurable screwdriver, which could not only be used, but also reconfigured for another application by a robot itself. The cost of the developed prototype including development costs is significantly lower than that of a commercially available solution. What separates our screw driver from the conventional ones is the specially designed screw bit exchange system. It consists of two main components, the power transmission shaft and the screw bit plug, which attaches to the shaft. The screw bit plugs can be fitted with any screw bit with a DIN 3126-E6,3 shank and are designed in such a way that they can easily be modified to accommodate any other shank shape. The operation of the screw bit exchange system. With the basic concept of a rotary table in mind and with the goal of lower price tag, we have developed a passive rotary table. The rotation of the rotary table is accomplished by a robot grasping the work piece and rotating it into the desired position. At that time, three plungers mounted on the pneumatic cylinders, mounted on the housing under the rotating portion of the table, are pushed upwards into the the holes, located at the bottom surface of the table top, thus locking the table into a desired orientation. Thanks to the conical design of the holes and plungers, the locked position is very repeatable even if position of the robot is a bit wrong. Servo gripper mounted at the tip of UR-10 robot using power over Ethernet. The BoxJoint system is used to assemble the workcell frame. It uses a combination of metal plates, special nuts and bolts to connect square beams of different sizes together. 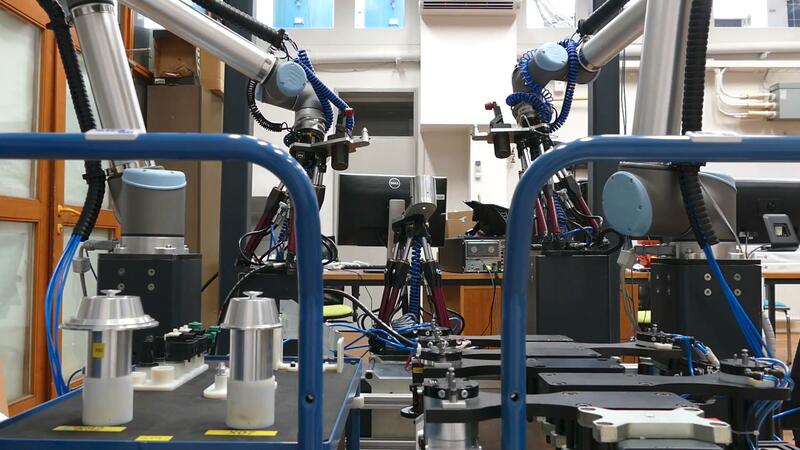 This system proved to be extremely useful to shorten the time needed to assemble a modular robotic workcell and for any followup modifications. We observed that the assembled frame is extremely mechanically stiff and causes no position errors when robotic operations are performed. Peripheral modules are crucial for the operation of the ReconCell system. The minimum workcell by itself can not perform any production task. The capabilities specific to the task are added in form of peripheral modules such as fixtures, end-effector storage, material flow management, and other application-specific equipment. The peripheral modules can be equipped with computational capabilities that store coordinates of points of interest, maintenance data, control pneumatic valves, and other application-specific hardware. In general, all peripheral modules are designed to be self contained units. The peripheral modules are connected to the cell whit Plug and produce (PnP) connectors. They are connectors developed in the ReconCell project that mechanically couple peripherals to the main cell frame as well as pass through pneumatics, power, and Ethernet communication. ELVEZ use case peripheral modules.